Hot flashes are some of the most dreaded symptoms of menopause, especially because a hot flash can occur suddenly and leave you sweaty and uncomfortable. Many women experience hot flashes and assume that they need to suffer through the discomfort, and they patiently wait for years… hoping that the hot flashes will eventually go away on their own. But, it has been found that women frequently experience hot flashes for many years, and it is very possible that you might have these symptoms for as long as 10 years after your last menstrual cycle. There is hope though, because it is possible to reduce or completely eliminate hot flashes and other symptoms of menopause. If you are proactive with your health and use natural remedies to balance your hormones, then you can experience relief. Most women going through menopause report either hot flashes, night sweats, or both. Generally, untreated symptoms last for 2 to 5 years, although they may last for more than a decade for some women. The severity of the hot flashes can vary from one woman to the next. For example, some women have mild hot flashes that are somewhat annoying, but they don’t cause much disruption for their daily life. On the other hand, hot flashes can be very debilitating and severe for other women, resulting in heavy sweating and difficulty moving about daily activities when a hot flash is occurring. Not every woman will experience hot flashes, but a large majority of women will experience at least mild hot flashes at some point during menopause. Certain factors might increase the risk of hot flashes, including women who have a history of smoking, a previous hysterectomy, or high alcohol consumption. 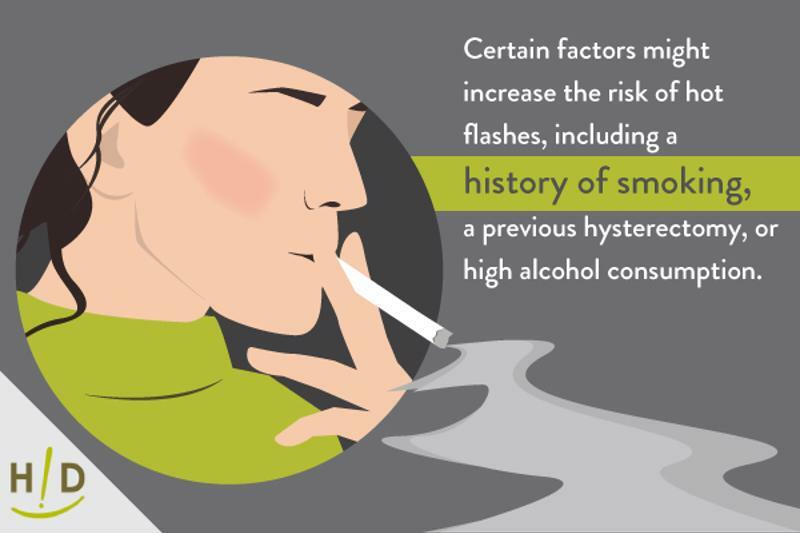 Smoking may increase the risk of hot flashes. Most conventional doctors will suggest hormone replacement therapy as a treatment if you want to get rid of menopausal hot flashes. The problem is that these treatments have been linked with serious side-effects, such as heart disease and cancer. It’s not worth the increased risk of these life-threatening diseases in order to experience relief from hot flashes! A better alternative is a natural approach. By utilizing the combination of a healthy diet, regular exercise, and high quality supplements, you can find relief from the symptoms of menopause without putting your health at risk. One key aspect to reduce hot flashes is to decrease your consumption of sugar, especially refined sugar such as candy and dessert. It has been found that sugar consumption might increase the frequency and intensity of hot flashes, and many women notice a difference when they cut refined sugar from their diet. 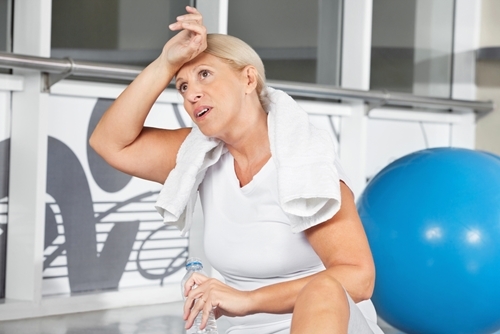 Some women have reported that their hot flashes completely go away after eliminating sugar! Here at Hallelujah Diet, our goal is to help you find the relief you are looking for, so that you can get rid of the uncomfortable symptoms of menopause and feel better about your health. Learn more about our natural supplements that can help reduce the symptoms of menopause. Evening Primrose Oil capsules made my hot flashes disappear! This was a good blog. Great information about the hot flashes. I have heard about removing sugar will help a person that still is having the hot flashes. The hot flashes can be very uncomfortable as well. Just thank God my hot flashes is not that bad anymore.